One of the more cost-effective measurements in a paper mill is that which monitors the flow of pulp stock into the head box of the paper machine. The stock level in the head box directly affects the thickness of the stock being laid onto the forming screens and the thickness of the end product. Because there are normally variations in the thickness of the pulp stock as it is laid onto the forming screens, excess stock must be laid on to ensure that a minimum thickness is maintained. Since the finished product is measured by weight, this figure is referred to as the "basis weight" of the product. Basis weight is defined as the weight of 500 sheets of paper cut to a standard size, usually 17" x 22" for bond paper, 25" x 38" for text, offset, and coated papers, and 20" x 26" for cover papers. Magnetic flowmeters are often used to measure the flow of pulp stock into the head box. Since pulp stock tends to be a noisy measurement with a magnetic flowmeter, long damping times are traditionally used to smooth the output of the meter. Unfortunately, this results in slow response from the meter and wasted pulp stock because the level in the head box must be kept high to avoid gaps or voids in the final product. While reducing the damping in a pulsed DC magmeter will result in quicker response, it can also result in a noisy signal. The noisy signal causes the valve controlling the pulp stock level in the head box to chatter which effects level control in the head box. The resulting thickness or "basis weight" of the end product is then compromised. Yokogawa's unique simultaneous dual-frequency excitation method and optional enhanced dual frequency excitation method can offer benefits in this application which can result in tighter control, faster response, more end product per batch, greater profit and a direct cost savings to the customer. In slurries, such as pulp stock, noise is generated when "pulp fiber" collide with the electrode. The collision displaces a thin oxide layer present on most electrodes, and electrical noise is generated when the exposed metal re-oxidizes. Slurry noise has its greatest magnitude at low frequencies, so conventional magmeters using low frequency DC excitation (6.25 - 25 Hz) can suffer most from slurry noise. 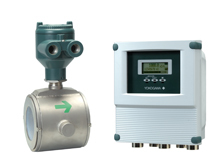 High frequency AC meters using 50, 60 Hz excitation do a good job of reducing slurry noise due to their high frequency sampling rate, but have problems with zero stability and poor accuracy, typically 1% of span. Yokogawa's dual-frequency excitation method and optional enhanced dual frequency excitation method have the advantages of both high and low frequency excitation. Dual-frequency excitation provides fast response time, (0.1 seconds) excellence zero stability, 0.35%, 0.2% as option of rate accuracy and immunity to slurry noise. AXF's new Enhanced Dual Frequency option provides an even higher excitation frequency of 165Hz for maximum slurry noise reduction when needed, without sacrificing zero stability. Since dual-frequency excitation and optional enhanced dual frequency excitation method are all but immune to the noise generated by slurry and pulp stock flows, lower damping values can be used while maintaining tighter control and allowing less variation of the pulp stock level in the head box. This results in more consistent pressure from the head box to the forming screens and less variation in the thickness and basis weight of the end product. Since there is less variation in the end product, the mill can set its control point closer to the desired basis weight figure, reducing waste and resulting in more end product from the same amount of pulp stock. More end product means more profit from each batch. As an example, the application of an ADMAG magnetic flowmeter at a major paper mill resulted in an estimated cost savings of several hundred thousand dollars a year on a large machine. Another approach to solving slurry or pulp stock noise, used by some of our competitors, is the brute force approach or using high power to increase the signal to noise ratio. There are several disadvantages in using high power to overcome noisy applications. The power consumption is considerably higher due to the extremely high drive current that is generated by the converter. That results in a much higher cost of ownership and fewer instruments on that electrical circuit. Some competitors use up to twenty times the drive current of ADMAG AXF (3-5 amps vs ADMAG AXF's 250 mA). Drive currents this high can lead to a number of failure modes. The coils may experience shortened service life, and the resulting heat buildup can cause liner failures if there is no flow to dissipate the heat. These are the same types of failures and cost of ownership issues that plagued AC meters in the past and drove the changeover to pulsed DC meters. The AXF on the other hand, gives you the best of both worlds; the high immunity to noise of the AC meters and the good zero stability and accuracy of a DC meter. The use of platinum-iridium electrodes rather than stainless steel can further improve immunity to slurry noise. Platinum-iridium electrode has better characteristics that produces less electro-chemical noise than stainless steel when pulp fiber collide the electrode. Output fluctuations can be reduced 1/3 to 1/10 that of electrodes made of stainless steel.